Sure Jim Miller isn’t guaranteed a shot at the UFC lightweight crown if he beats Nate Diaz, although Diaz will get next dibs at the title should he reign supreme, Miller will be fighting for a greater purpose when he steps into the Octagon on Saturday. The “#MyFightMatters” T-shirt (Pictured) Miller will be donning on his way to the cage was inspired by Daniel James Miller, the 155-pounder’s infant nephew who was born with autosomal recessive Polycystic Kidney Disease. TapouT has graciously partnered with Miller to provide financial support for Daniel’s fight against PKD. With each sale of the $29.95 T-shirt, the mixed martial arts clothing giant will generously donate $10 straight to the Daniel James Miller Foundation. Please click HERE if you would like to contribute directly to Daniel’s foundation. 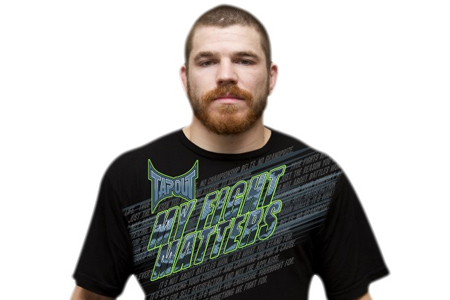 Daniel is the son of Jim’s brother and UFC middleweight, Dan Miller. Miller and Diaz headline Saturday’s show inside inside IZOD Center in East Rutherford, New Jersey. FOX will broadcast the main card live beginning at 8PM ET/5PM PT.